As I read through the thirtieth chapter of Psalm. I can resonate with David’s heart. 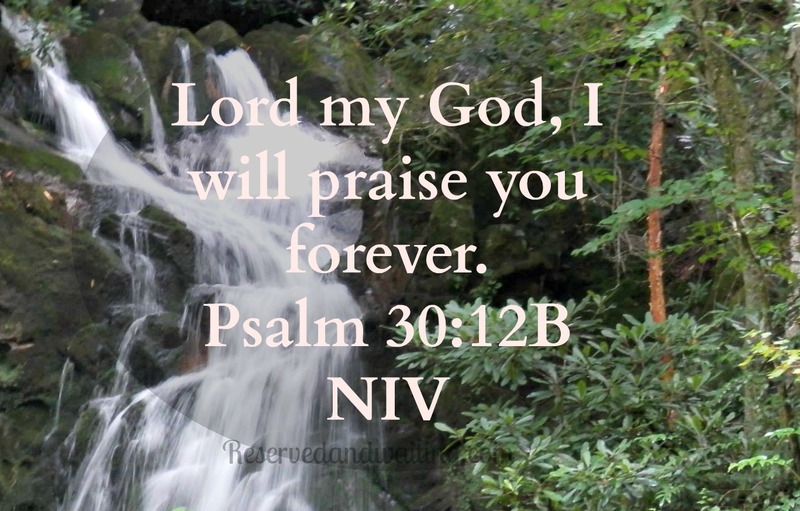 He verses expressions of thankfulness and praise toward God. As this chapter took me through a rollercoaster of emotions and shared expressions, my mind recalls the events of my life thus far. I don’t know the loved ones of the deceased well enough. What do I do with my son? These are not very good reasons and every single one of them displays to me a self-serving problem of the heart. To those I have hurt with these actions, I ask for your forgiveness. In these past seven years, I have attended one memorial service a few years ago. I had to pull up my big girl pants and do what I knew I needed to do. It was hard and very heartbreaking. The attitude of my heart was not where it should have been and no reward of continued healing was offered by God. As I have said, I stepped out of that comfort zone this past weekend and attended the funeral of a young lady. The difference this time was the attitude of my heart. The reasons of the past did not even rear their ugly head. My Lord gave me a distinct sense to attend this celebration of life. It was not because others would not attend because it came down to standing room only. It was not because I did not know the loved one left behind well enough, on the contrary I have come to know them well. It was not because I had to work for it was held on a day off. It comes down to God asking me for obedience so that He could bless. For the past couple of weeks, I have poured my pleads to God for this family and their loved one. Fully expecting a different result, as I did seven years ago with my own request. When news came that this lady passed away, my heart broke for the family, as I revisited the piece of my heart that is missing. As I sat in attendance of her celebration, memories replayed in my mind and tears of continued healing ran down my cheeks. This family celebrated this ladies young life with glorifying the name of God, blessing His holy name and with praises unto Him, just as we had done. His comfort and peace is with us however in times like these I embrace them with arms wide open. Because of His faithfulness, never-ending love, His graces and mercies, we are able to exalt Him as our Lord and Savior. We can be like David knowing that God can and will turn our cries into dancing and our sorrows into joy. For in all things that we go through, we can and should declare our praises to God forever.